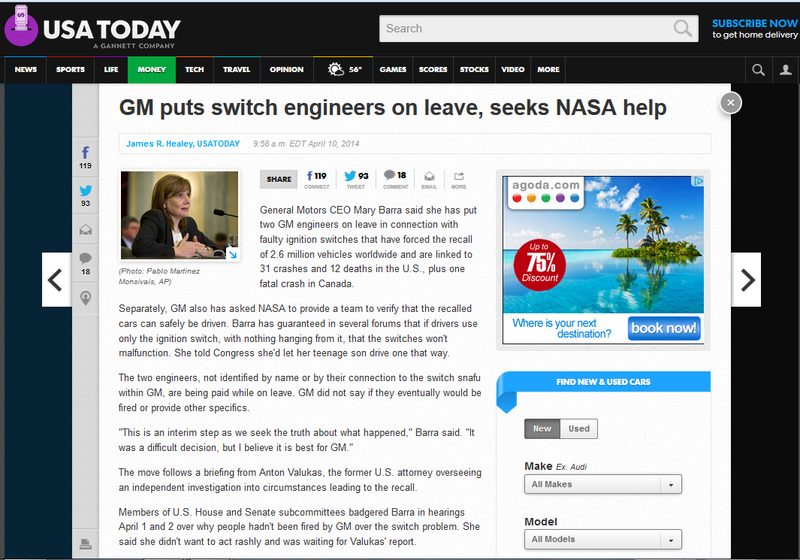 USA Today reported that General Motors put two engineers on leave over connection with the faulty ignition switches that have forced the recall of 2.6 million vehicles worldwide and are linked to 31 crashes and 12 deaths in the U.S., plus one fatal crash in Canada. In many ways, the culture of candor is not present in Malaysia. From my own observations, some people would be contented with providing lip-service or surface-job and they had hoped that their managements would go about tying loose ends whilst the managements on the other hand, felt that the sub-ordinates should work harder - chicken and egg scenarios. This is the culture that makes many people wanting to seek out to venture on their own rather than floating directionless in the ocean of the 'culture shock'. In retrospect, this is a democratic country of free will - if you think you can do better, nobody is stopping you - just do it and prove others wrong - shouldn't let anything hold you back from reaching for noble achievements. Nevertheless, sometimes we are forced to change beyond willingness. For instance, for the first time in the history (in my opinion), Malaysia is humbled by the generosity of others, all for the ironies of MH 370. Don't cry over spilled milk!! !